"SSNT really taught me about challenge and opportunity. Myotherapy is definitely growing in Australia and I think the quality of the Clinical Myotherapy students coming out of SSNT is extremely high. I think we’re at the forefront of what’s out there in the industry today." Clinical myotherapy is a system of health care focusing on assessment, treatment and management of musculoskeletal pain. Musculoskeletal pain can be divided into three categories: myofascial pain arising from trauma or muscle contracture; neuropathic pain deriving from the nervous system; and articular pain that originates from the joints. 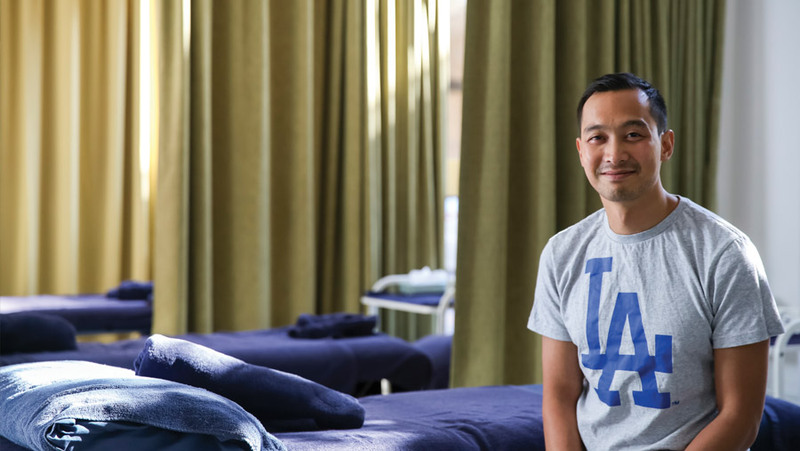 Clinical Myotherapists can treat various issues such as sporting and occupational injuries, stiffness and sore body, chronic overuse syndromes, symptoms associated with arthritis, back pain, neck pain, stress and tension, pregnancy and more. This three-year degree is approved by TEQSA (Tertiary Education Quality and Standards Agency) the National Australian accreditation body. Students will gain theoretical knowledge in the biomedical and clinical sciences combined with a proficiency in clinical reasoning and the dexterity to utilise specific manual skills. Students will learn how to ease muscle contracture and treat musculoskeletal pain caused by trauma, ageing and overload of muscles. Students will gain hands on experience at Think Wellbeing Centre under the guidance of experienced practitioners in a clinical setting treating public patients. This prepares graduates to confidently and successfully commence practice in the community. Career Prospects: Complementary clinics, Medical clinics, Sporting clubs and Industries that require the treatment of pain management and musculoskeletal treatment. Course tuition fees are available by contacting a Course and Career Advisor. If you are an eligible domestic student you may choose to defer some, or all, of your tuition fees through FEE-HELP. And as we are a university you can also take advantage of no loan fees on FEE-HELP when you study selected courses with us. Scholarships are available for this course to full-time on-campus students only. * SSNT reserves the right to increase fees by up to 10% in each calendar year to cover increases in the cost of course delivery. The total course cost will depend on the duration of the course and whether a student studies full time or part time. Online learning registered providers may offer overseas students up to one-third of their course online. If online or distance learning is offered, the registered provider must ensure that the overseas student is studying at least one unit that is face-to-face in each study period. Each subject you complete includes 3 assessments on average. Assessments are mapped to specific subject learning outcomes and may include quizzes, written assignments, presentation, reflective journal, case analysis, literature review, practical exams and written exams. Musculoskeletal Anatomy 2 builds upon the foundational knowledge of the formation and spatial relationships of the tissues and joints of the lower body that is gained in Anatomy and Physiology 1 (BHS101A) & Anatomy & Physiology 2 (BHS104A), and the musculoskeletal components of the human body gained in Musculoskeletal Anatomy 1 (CMY102A). This subject comprises the study of the back, thorax, pelvis, hip and lower limb. A practical component of this subject is essential and will incorporate anatomy wetlabs where available, so that students can examine specimens of tissues and regions of the human body in actuality. Dynamic anatomic and cadaveric software and models will also be part of the practical component. Clinical Assessment 1 (CMY105A) will provide the student with the theoretical knowledge and practical skills required to perform a comprehensive musculoskeletal and neurological assessment of the upper body. These skills are important to the practising Clinical Myotherapist as they essentially underpin the clinical reasoning of a consultation process. Students work in pairs practising assessment skills on each other under close supervision. Due to the practical nature of this subject, students are given ongoing feedback on their techniques and application during class. Students will be introduced to patient record keeping by keeping a log of the assessments they have undertaken and the outcomes they noted. Surface Anatomy & Trigger Point Location 1 introduces the student to the palpation techniques used to identify specific muscles and their trigger points and referred pain patterns, preparing the student for myofascial dry needling. Students work in pairs to locate and explore bony landmarks, tendons, muscles, ligaments, pulses and other soft tissue structures and areas of the upper body and limbs. Due to the practical nature of this class, students are given ongoing feedback on their techniques and application during class. A practical subject that covers a variety of soft tissue mobilisation methods including massage, myofascial release (MFR), cupping, muscle energy technique (MET), neuromuscular techniques and proprioceptive neuromuscular facilitation (PNF) stretching. Students will practise techniques on each other in the clinical classroom and under close supervision. Musculoskeletal Anatomy 1 builds upon the foundational knowledge of the formation and spatial relationships of the tissues and joints of the upper body that is gained in Anatomy and Physiology 1 (BHS101A). This subject introduces students to the musculoskeletal components of the human body in a theoretical and practical setting, and comprises the study of the axial and appendicular skeleton (upper limb), nervous system, cervical and thoracic spine, head, and shoulder. A practical component of this subject will incorporate anatomy wet labs where available, so that students can examine specimens of tissues and regions of the body. Dynamic anatomic and cadaveric software and models will also be part of the practical component. This subject studies the history of manual therapy and clinical myotherapy in Australia. Palpatory skills, thermal therapy, postural assessment and muscle management are introduced with attention to the comfort and safety of the patient and practitioner. WH&S and Healthcare law and ethics are introduced at a foundational level to complement the introduction to manual therapies and the initiation of industry placements. Research & Evidence Based Practice (BHS107A) provides essential knowledge in research methods and research article evaluation for complementary medicine students. This subject introduces the fundamentals of research practice and methods for the natural therapies including research design, methodology, analysis and basic statistical skills. This subject provides the student with the proficiency to be able to appropriately read, analyse and evaluate current healthcare research. Biochemistry 1 (BHS105A) is a core subject that builds upon the basic chemistry principles covered in Bioscience (BHS102A). It comprises an introduction to the basic biochemical compounds in the body. This subject includes the structure and function of carbohydrates, amino acids, proteins, enzymes, lipids and nucleic acid, DNA and RNA. The concept of gene expression and regulation is discussed in addition to cellular membrane structure and transport through the membrane. Anatomy and Physiology 2 (BHS104A) builds and expands on the information and skills learnt in Anatomy and Physiology 1 (BHS101A). This subject continues to investigate the structure and function of the human body with special attention given to the interaction between tissues, organs and systems that maintain homeostasis. The structure and function of the respiratory, cardiovascular, immune, lymphatic and special senses systems are covered in detail including the homoeostatic control mechanisms of each system and the integration of the systems in the body. The study of Anatomy and Physiology 2 (BHS104A) is vital in the education of healthcare practitioners to enable them to understand the structure and function of the human body as well as the importance of homeostasis and the ways in which the body maintains balance. Counselling & Communication Skills (BHS103A) encompasses counselling skills commonly needed by complementary and alternative healthcare practitioners. This subject comprises a practical approach to a variety of communication skills and strategies including promoting change, compliance, obstacles to change, systems, transition and self-care. Sessions facilitate the development of effective listening and responding skills, increased personal awareness and insight in order to assist the building of a therapeutic relationship. This subject is vital in the education of all complementary healthcare practitioners, as it enables them to understand and put into use communication skills essential for building a therapeutic relationship in practice and supporting clients through change. Bioscience (BHS102A) provides a foundational knowledge for further studies in anatomy and physiology, clinical nutrition, biochemistry and pharmacology. It comprises the study of relevant concepts of general, physical and organic chemistry and includes atomic theory, the periodic table, chemical compound structure, nomenclature, behaviour and bonding as well as organic compounds and their basic properties and reactions. Bioscience (BHS102A) is a crucial component of the modern healthcare practitioner’s education in order to provide the basic building blocks for structural and therapeutic knowledge. Anatomy and Physiology 1 (BHS101A) introduces the basic concepts and terminologies required to study and understand the structure and function of the human body. The interaction between tissues, organs and systems that maintain homeostasis is covered in detail. In addition, this subject covers the structure and function of cells and epithelial tissue, the internal structural anatomy of the human body and the integumentary and musculoskeletal systems. This subject is vital in the education of all complementary health practitioners, as it enables them to understand the structure and function of the human body as well as the importance of homeostasis and the ways in which the body maintains this balance. In this practical and theory based class the student will enhance their advancing palpation techniques to perform a comprehensive musculoskeletal and neurological assessment of the spine, sacro-iliac joint and TMJ. Working in pairs students will build on their practice assessment techniques in a supervised and feedback orientated environment. Students learning will emphasize critically analysing assessment methods based on current research and literature. Pain Management 2 gives the students comprehensive information about the assessment, treatment, diagnosis and management of musculoskeletal conditions of the lower body. Students develop understanding of musculoskeletal conditions affecting the lower body including the aetiology, incidence, presenting signs and symptoms, clinical and diagnostic features. At the completion of Pain Management 2, students will be able to describe common pharmacological and cutaneous interventions for pain. Myofascial Dry Needling 2 provides the student with further knowledge on myofascial trigger points and their associated pain patterns and further develops skills in dry-needling techniques. The focus is on muscles of the torso and lower body. Clinical Health Management provides the student with the ability to put together a Clinical Myotherapy treatment from history taking to assessment, diagnosis, treatment and management, and provides a platform for their future Clinical Practicum subjects. Due to the practical nature of this class, students are given ongoing feedback on their techniques and application during class. Exercise Prescription 1 introduces students to the practical application of exercise as a therapeutic approach to patient management. The theories, principles and foundations of exercise prescription are applied to demonstrate suitable and appropriate types of exercise for a range of patient presentations. Students develop an ability to safely and effectively prescribe exercise under close supervision in a classroom situation. Due to the practical nature of this class, students are given ongoing feedback on their techniques and application during class. Musculoskeletal Pathology encompasses the common pathological conditions that a Clinical Myotherapist will see in practice and builds upon the core pathological concepts provided in General Pathology (BHS201A). This subject address the morphology, aetiology and underlying general principles operating in disease states in the neurological, musculoskeletal and integumentary systems, in addition to select disease states in the endocrine and pulmonary systems. An introduction to the currently used laboratory diagnostic methods that would inform diagnosis of conditions in a general practise is also included in this subject. This subject is a key component in the education of a Clinical Myotherapist, as it provides knowledge of the various disease states that will be seen in practice, and correlates these disease states at a cellular and gross anatomical level with clinical signs and symptoms. Pain Management 1 gives the students comprehensive information about the assessment, treatment, diagnosis and management of musculoskeletal conditions of the upper body and builds upon the foundational knowledge acquired in subjects such as Anatomy & Physiology, Pathology and Clinical Assessment. Students develop understanding of musculoskeletal conditions affecting the upper body including the aetiology, incidence, presenting signs and symptoms, clinical and diagnostic features. At the completion of this subject students will be able to distinguish between acute and chronic pain states and evaluate the most effective methods of treatment and management employing sound clinical reasoning. Myofascial Dry Needling 1 will provide the student with continued and additional information on myofascial trigger points and their associated pain patterns, and develop the ability to apply dry needling techniques in order to reduce the noxious activity of myofascial trigger points in the upper body. This subject will cover the practical application of the principles of infection control and will be delivered in accordance with current Australian safety standards. The ethical considerations for the practical application will be considered throughout and reflected upon in regards to needling for specific pathologies. Biomechanics & Kinesiology introduces the students to the concepts of motion analysis for movements around a joint, forces involved in movement and positioning, and instrumentation for motion analysis. On completion of this subject, the students will be able to analyse movement from real-life examples, and discuss the forces involved. This subject provides the underpinning knowledge for exercise prescription. Surface Anatomy & Trigger Point Location 2 furthers the student to the palpation techniques used in identifying specific muscles and their trigger points and referred pain patterns preparing the student for myofascial dry needling. Students work in pairs to locate and explore bony landmarks, tendons, muscles, ligaments, pulses and other soft tissue structures and areas of the lower body and limbs. Neuroscience & Motor Control introduces students to International Association for the Study of Pain (IASP) terminology and aids the student in conceptualising the neurophysiology of pain. The IASP are a worldwide professional association dedicated to research, diagnosis and treatment of pain and, as such, set the standard for pain management guidelines. This subject provides students with a deeper understanding of human neuroanatomy and neurophysiology. The most recent theories regarding the development of pain and myofascial trigger points in the human body are discussed together with introducing students to the methods, procedure and contraindications of myofascial dry needling and the supporting evidence. General Pathology (BHS201A) introduces the basic pathological processes operating in the body and the ways in which disease may result from injurious stimuli. Basic pathological processes of response to injury, growth abnormalities, degenerative disorders of the musculoskeletal and neurological systems, immunology, toxicology and microbiology, and their characteristic diseases are studied. This subject is vital in the education of all complementary healthcare practitioners as it enables them to understand the nature of various disease states, and correlates these at a cellular and gross anatomical level with clinical signs and symptoms that may be seen in practice. Myotherapy Clinical Practicum 3 is the final clinical practicum for the Clinical Myotherapy degree. Students are closely monitored by a suitably qualified and experienced practitioner. In this subject they are drawing on every aspect of their studies to assess, diagnose, treat, manage and refer patients in the student clinic environment. Neuropsychology provides the student with knowledge about the psychological aspects of pain in the human body and psychological considerations in pain management. Students develop and explore knowledge of the current theories relating to the environmental dimensions and biopsychosocial influences of pain and their relationship to psychological issues. Neuropsychology will further increase the student’s knowledge in health behaviour models, mental health issues and the role of social and occupational factors in pain management. In this subject students write a literature review on a topic of their choice, which must examine a clinical aspect of their speciality. The emphasis is on presenting and critically evaluating current literature by searching for and appraising the literature, and writing a clear and fully referenced literature review. Students will be expected to present a proposal early in the trimester, and a full literature review by the end of the trimester. The in class experience is practical in nature where the students are provided a collaborative environment to cover the process of writing a literature review, ask questions and receive feedback on their own projects. In Myotherapy Clinical Practicum 2, students continue the student clinic experience, integrating new information as other theoretical and practical subjects are completed. Students are closely monitored by a suitably qualified and experienced Clinical Myotherapist. Pain Management 3 follows the curriculum provided by the International Association for the Study of Pain (IASP), discussing medical and alternative treatment and management of painful conditions. This curriculum provides the student with an in-depth understanding of the pain management strategies for a variety of conditions and an appreciation of other options of treatment and management. Building on the knowledge and skills of Exercise Prescription 1 (CMY209A), and Lifespan Myotherapy (CMY301A) students are developing their exercise prescription skills to embrace a variety of resources, equipment, facilities, settings & venues in their management of specific conditions and special populations. Due to the practical nature of this subject, students are given ongoing feedback on their techniques and application during class. In Myotherapy Clinical Practicum 1, students are introduced to working in a student clinic. Under the close supervision and monitoring of an experienced practitioner, students will begin to consult with and treat members of the public as they present with injuries or conditions. In this subject students are required to begin integrating all of the theoretical and practical studies undertaken in the course so far. The clinical experience provides the student with an opportunity to formulate and implement evidenced based and relevant treatment plans while exhibiting appreciation of the necessary ethical and medico-legal responsibilities inherent in the practitioner-patient relationship. Joint Mobilisation brings together the theory and practical approaches to assessment and treatment. This passive movement technique is applied to a spinal or peripheral joint in which an oscillatory movement is performed within the control of the patient. This subject draws on the ‘concept’ of treatment as developed by G. Maitland in which factors such as clinical reasoning, examination and evaluation are applied to the role of mobilisation in the management of musculoskeletal disorders. Musculoskeletal Integrative Pharmacology comprises a study of basic principles of pharmacology, the pharmacokinetics of drugs commonly used in medical practice and common drug – drug and drug-myotherapy treatment strategy interactions. Drugs for pain, inflammation, psychological functions, cancer, infection and the cardiovascular, respiratory, gastrointestinal, reproductive and endocrine systems are discussed. This subject examines drug actions, uses, contraindications, adverse effects and interactions, together with implications for myotherapy treatment strategies. Musculoskeletal Integrative Pharmacology is crucial for the modern myotherapy practitioner to understand common medications that clients may be taking and common interactions between these medications and treatments as well as medications that support myotherapy treatment strategies. This subject also emphasizes the need for clear lines of communication and common language between doctors and myotherapy practitioners in order to obtain the best health outcomes for clients. Professional Practice (BHS401A) comprises the basic skills needed for the operation and management of a complementary healthcare practice and provides an understanding of the legal and ethical requirements that are pertinent to the complementary healthcare. Sports Injury Management builds upon the clinical skills of assessment and treatment, with specific application to the athletic populations. This subject provides students with the underpinning theory and a range of practical skills to work in the sporting environment and support the prevention and management of common sporting injuries. Professionalism, ethics and responsibilities are addressed, along with emergency action planning and on-field trauma management skills. Students will learn to apply evidence based and clinically reasoned decisions in sport specific return-to-play scenarios, and gain the practical skills to support return to play including taping and pre-game athlete support. Students will be expected to complete clinical placement hours with a sporting club either previously or concurrently with this elective to support learning. Assistance to find placements will be provided. Lifespan Myotherapy provides students with the knowledge of how to treat musculoskeletal pain that is relevant to paediatric and geriatric patients as well as in-depth knowledge on contraindications/precautions and acceptable treatments for pre and post-natal patients. This subject also provides students with knowledge about the impact of illness/injury/pain on quality of life. It incorporates theory on the history and efficacy of CAM and traditional remedies. Information relating to disease-specific population groups, as well as indigenous health issues and cultural implications for treatment will be incorporated. This subject provides students with fundamental nutrition knowledge through examining the relationship between food, nutrition and human health. Students will learn about macro and micro-nutrition, dietary guidelines, role of nutrition in metabolism, health maintenance and disease, nutrient rich food sources, and the specific nutritional requirements throughout the lifespan. Students will also learn how to identify and construct a healthy diet according to specific dietary guidelines, and know the impact of nutritional deficiency and excess as they relate to health and disease. The occupational environment plays an important role in combating or promoting the rise of chronic disease and disability. This environment has the capacity to affect the physical, psychological, economic and social well-being of workers’ and thus, proper attention to workers’ health offers vast opportunities for workers and employers alike. In this subject students will explore evidence linking worker health and wellbeing to organizational health and business performance. Specific analysis for business needs will be considered, with practical interventions designed to educate and enhance the occupational environment. The problem of falls is a significant global issue and can result in injury, hospitalisation, loss of independence, social isolation, depression, poor health status, institutionalism and death. The World Health Organisation identify falls as occurring as a result of complex interrelationships between biological, behavioural, environmental and socioeconomic risk factors. With the predicted costs of falls expected to increase exponentially as our population ages there is a need for effective preventive strategies such as active ageing programs. This subject examines these complexities of ageing, where students will learn to assess falls risk and develop effective prevention strategies that promote wellbeing in ageing populations. Here for good. We believe society is best served when our students, faculty, and our entire organisation use our collective skills and experience to create positive and lasting change. Our students and graduates are improving lives and making our world better. Our institutions are providing the critical skills, knowledge and support to help make this happen. Social Enterprise is an exciting theoretical based subject driven by the desire to create positive change through entrepreneurial activities. By providing students with a framework to understand business model generation and the skills to source, evaluate, and measure opportunities, Social Enterprise empowers students to conceptualise, develop, and propose new ventures that focus primarily on social change for good. In addition, this subject helps students understand and analyse different entrepreneurial business strategies, as well as incorporate theoretical discussions on major trends and issues in the social economy. Industries that require the treatment of pain management and musculoskeletal treatment.